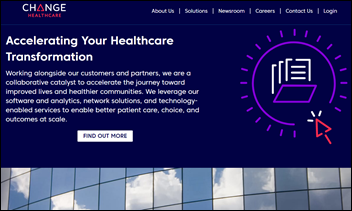 A Wall Street Journal report says that Chicago-based waiting room digital advertising company Outcome Health overcharged drug company advertisers by intentionally claiming an inflated number of screens in use, manipulating third-party ad performance analyses, and creating phony ad campaign screen shots. The company, formerly known as ContextMedia Health, has placed three employees on paid leave pending an investigation. A former executive who confronted co-founder and CEO Rishi Shah about questionable business practices lasted only two weeks, joining the seven executives who have left the company so far this year. Chicago Mayor Rahm Emanuel helped dedicate a 29-story building that was renamed Outcome Tower in late September, the same day the company finalized plans to lay off 76 of its 600 employees. Drug companies had previously obtained refunds from the company after their reps noticed that claimed devices in medical practices weren’t actually there. 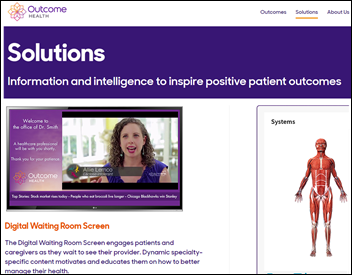 Outcome has also been accused of altering prescribing data from QuintilesIMS to make its campaigns look more successful, which earned Outcome a scolding from IMS. 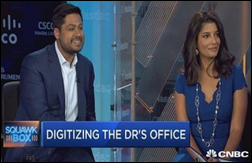 Outcome Health’s last fund-raise valued it at $5 billion, making co-founders Rishi Shah and Shradha Agarwal, aged 31 and 32, respectively, paper billionaires. From Kyle vs. Givenchy: “Re: Athenahealth. Per the KLAS report, 13 of 28 Athenahealth customers have delayed or cancelled go-lives, not the 20 claimed. Seven of eight reported pharmacy-related issues, while end users are less enthusiastic than executives.” Unverified. I don’t see KLAS reports since they quit sending them to me, so I’ll take your word for what it found. From Jake Asp: “Re: telemedicine. I didn’t see this news item mentioned.” I rarely mention telemedicine news because it has nearly zero to do with health IT. Talking to a doctor over a video connection is no different than calling them up on the telephone and that’s not going to get health IT geeks excited. I’m puzzled by health IT sites fawn over virtual visit news or proposed telehealth regulatory changes, maybe because those topics are easy for inexperienced people to write about. I go off-topic only (sometimes wildly) when I read something that I think will interest my peers and even then it’s only a tiny blurb rather than a padded-out article. Welcome to new HIStalk Platinum Sponsor Change Healthcare. The new, Nashville-based, 15,000-employee Change Healthcare — one of the largest independent technology companies in the US — includes most of the former McKesson Technology Solutions as well as the former Emdeon, which was renamed Change Healthcare when Emdeon acquired that company in September 2015. The company serves payers (Intelligent Healthcare Network for financial and administrative transaction processing); providers (eligibility, claims, productivity, imaging, clinical workflow, and value-based care); and consumers (True View Health Shopping Platform). The company just announced healthcare’s first enterprise blockchain solution. Thanks to Change Healthcare for supporting HIStalk. Listening: new from the amazing Michigan-based hip-hop artist NF (born Nathan Feuerstein), whose hard-hitting yet non-explicit lyrics allow focusing on the anger and self-doubt he describes rather than the usual vapid, misogynistic swagger. The 26-year-old wrote about his mother’s drug overdose death in “How Could You Leave Us?”: “I don’t get it mom, don’t you want to watch your babies grow? ; I guess that pills are more important, all you have to say is no; But you won’t do it, will you? You gon’ keep popping ’til those pills kill you; I know you gone but I can still feel you.” His long tour that starts in January includes a lot of stops in health IT centers like Nashville, Atlanta, Raleigh, Boston, Madison, and Kansas City. I’m also enjoying questionably named but inarguably talented Wales-based hard rockers Catfish and the Bottlemen. This week on HIStalk Practice: Lightbeam Health Solutions will provide population health management solutions to American College of Osteopathic Family Physicians. In the Consultant’s Corner, Brad Boyd offers tips to help practice administrators proactively address physician burnout. 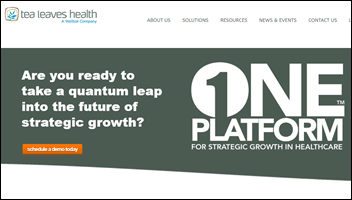 Azalea Health merges with Prognosis Innovation Healthcare. Vermont physicians face criticism as medical marijuana clinics attempt to take off. ZDoggMD brings the house down at MGMA. Follow-up study shows PCP antibiotic overprescribing habits could benefit from “nudges.” Hope Orthopedics of Oregon kicks off patient-reported outcomes program. Formativ Health helps independent MDs in Pennsylvania transition to value-based care. October 19 (Thursday) noon ET. “Understanding Enterprise Health Clouds with Forrester: What can they do for you, and how do you choose the right one?” Sponsored by: Salesforce. Presenters: Joshua Newman, MD, chief medical officer, Salesforce; Kate McCarthy, senior analyst, Forrester. McCarthy will demystify industry solutions while offering insights from her recent Forrester report on enterprise health clouds. Newman and customers from leading healthcare organizations will share insights on how they drive efficiencies, manage patient and member journeys, and connect the entire healthcare ecosystem on the Salesforce platform. October 24 (Tuesday) 1:00 ET. “Improve Care and Save Clinician Time by Streamlining Specialty Drug Prescribing.” Sponsored by: ZappRx. Presenter: Jeremy Feldman, MD, director, pulmonary hypertension and advanced lung disease program and medical director of research, Arizona Pulmonary Specialists. Clinicians spend an average of 20 minutes to prescribe a single specialty drug and untold extra hours each month completing prior authorization (PA) paperwork to get patients the medications they need. This webinar will describe how Arizona Pulmonary Specialists automated the inefficient specialty drug ordering process to improve patient care while saving its clinicians time. October 25 (Wednesday) 1:00 ET. “Delivering the Healthcare Pricing Transparency that Consumers are Demanding.” Sponsored by: Health Catalyst. Presenter: Gene Thompson, director, Health City Cayman Islands. Health systems are unlike every other major consumer category in not providing upfront pricing information. Learn how one health system has developed predictable, transparent bundled pricing for most major specialties. Attendees will gain insight into the importance of their quality measures and their use of actual daily procedure costing rather than allocated costs. They will also learn about the strategic risk of other market participants competing with single bundled pricing. The organization’s director will expand how its years-long process is enabling healthcare delivery reform. October 26 (Thursday) 2:00 ET. “Is your EHR limiting your success in value-based care?” Sponsored by: Philips Wellcentive. Presenters: Lindsey Bates, market director of compliance, Philips Wellcentive; Greg Fulton, industry and public policy lead, Philips Wellcentive. No single technology solution will solve every problem, so ensuring you select the ones most aligned to meet your strategic goals can be the difference between thriving or merely surviving. 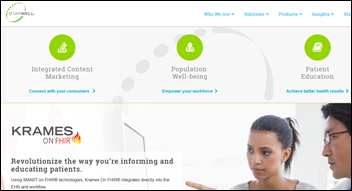 From quality reporting to analytics to measures building, developing a comprehensive healthcare strategy that will support your journey in population health and value-base care programs is the foundation of success. Join Philips Wellcentive for our upcoming interactive webinar, where we’ll help you evolve ahead of the industry, setting the right strategic goals and getting the most out of your technology solutions. November 8 (Wednesday) 1:00 ET. “How Clinically Integrated Networks Can Overcome the Technical Challenges to Data-Sharing.” Sponsored by: Liaison Technologies. Presenters: Dominick Mack, MD, executive medical director, Georgia Health Information Technology Extension Center and Georgia Health Connect, director, National Center for Primary Care, and associate professor, Morehouse School of Medicine; Gary Palgon, VP of healthcare and life sciences solutions, Liaison Technologies. This webinar will describe how Georgia Heath Connect connects clinically integrated networks to hospitals and small and rural practices, helping providers in medically underserved communities meet MACRA requirements by providing technology, technology support, and education that accelerates regulatory compliance and improves outcomes. 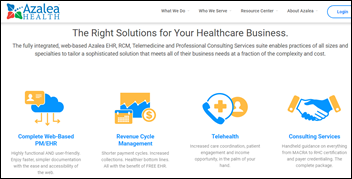 Atlanta-based ambulatory EHR/PM vendor Azalea Health acquires community hospital EHR vendor Prognosis Innovation Healthcare, which was known as Prognosis Health Information Systems until it was renamed in 2014 by its new private equity owners. I interviewed Ramsey Evans, then CEO of Prognosis, way back in September 2010. He left the company in 2013 to return to Keais Records Retrieval as CFO and board chair – the Houston-based company offers electronic medical records retrieval for attorneys. Consumer health benefits and wellness technology vendor Welltok acquires Tea Leaves Health, which offers consumer and physician relationship management systems. Ziff Davis, which bought 60-employee, Atlanta-based Tea Leaves for $30 million in 2015, sold it to Welltok for $83 million. 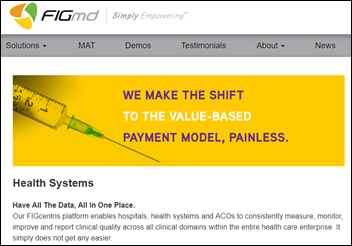 Ziff Davis is owned by Internet company J2 Global, which also owns Everyday Health (MedPage Today, KevinMD.com and MayoClinic.org). ZD said in February 2017 that Tea Leaves might never make a profit. The private equity owner of revenue cycle technology vendor Practice Insight sells the business to an unnamed buyer. Wellness app vendor StayWell, a subsidiary of drug maker Merck, acquires MedHelp’s health engagement platform. Meanwhile, health shopping site operator Vitals buys MedHelp’s online health communities business. 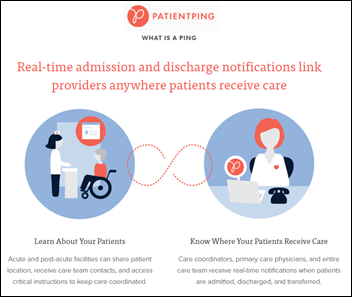 North Carolina Hospital Association chooses PatientPing to offer statewide, real-time care coordination. 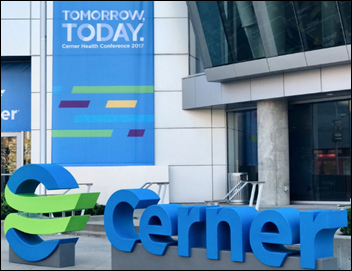 Cerner tells its user group attendees that it will continue to offer free CommonWell services through 2020. 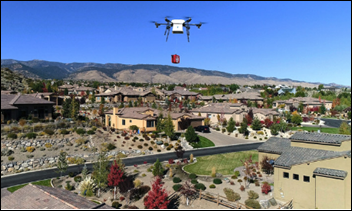 Flirtey, which uses drones to deliver emergency medical supplies, will send automated external defibrillators in response to 911 cardiac arrest calls received by northern Nevada emergency medical provider REMSA. 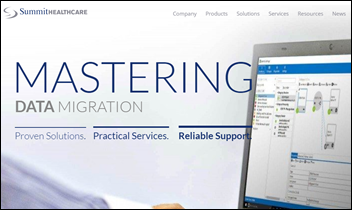 Summit Healthcare chooses system integrator Speedum Technologies Health Solutions to resell its integration platform, scripting tool, and downtime reporting system. 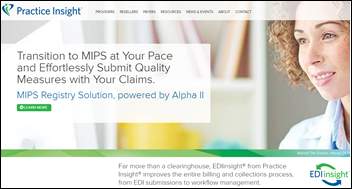 EClinicalWorks will partner with clinical data registry and analytics vendor FIGmd to offer its EHR users connectivity to specialty registries. 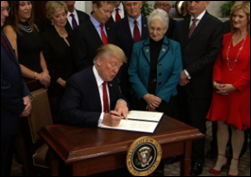 President Trump takes another step to kill the Affordable Care Act by signing an executive order that will make it easier for small businesses and perhaps even individuals to band together to buy health insurance across state lines (which is already legal but rarely done since it’s hard for insurers to create networks in new states and such sales require state-by-state approval). The order will also again allow the sale of short-term policies that don’t cover pre-existing conditions, which the ACA halted. Critics worry that cheap but low-quality plans will draw healthy people away from ACA plans, driving up premiums as sicker people are left without alternatives. Health systems will be watching the change in their patient bases closely. ACA expert Charles Gaba’s expert analysis is sobering and is a reminder that “slicing up the risk pool does absolutely nothing to lower the total cost of healthcare.” HHS will be responsible for setting definitions in drafting the legislation, which will likely take several months if the order survives the inevitable legal challenges. 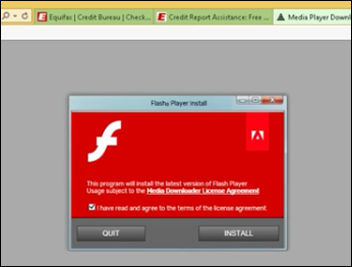 A security researcher finds that the website of Equifax – fresh off its massive breach that exposed the information of 146 million people – was hacked this week, with visitors being tricked into installing an adware-pushing app posing as an update to Adobe Flash. 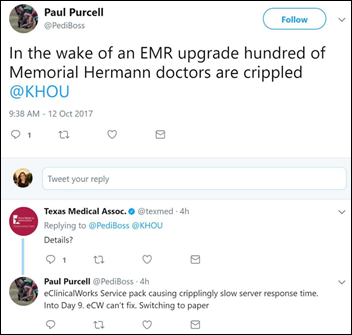 Paul Purcell, administrator of STEP Pediatrics (TX), reports that Memorial Hermann some doctors are going back to paper after a nine-day performance problem caused by an EClinicalWorks upgrade. An interesting review by Pew Charitable Trusts finds that a remarkable number of Americans use life-sustaining technologies in their homes and are thus vulnerable to storm-related power outages. 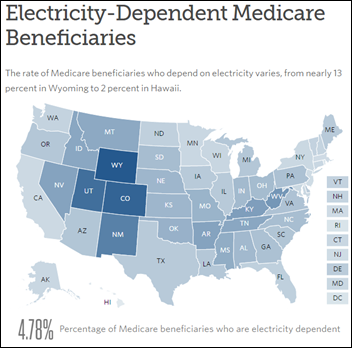 HHS mined its Medicare claims database to create a map of people who had received government-provided medical equipment to help health officials locate them in an emergency. In a PR move that always strikes me as a self-serving form of cost-shifting, at least one Las Vegas hospital and two ambulance services announce that they will not charge victims of the recent mass shooting for the services they received. Other patients whose circumstances were judged as less meaningful will have to cover the cost of the non-profit largesse, which would ring truer if the organizations just did it without crowing. A Harvard Business Review article by two Bain & Company’s healthcare partners cites surveys suggesting that doctors understand that the cost of drugs and clinical care are too high, but that nobody’s inviting them to the table to figure out how to control costs, improve performance, or move to new reimbursement models. Analysis finds that dialysis operator DaVita makes more than half its profit from patients who receive charity help to pay their insurance premiums, with 13 percent of its patients receiving help from the American Kidney Fund to which DaVita makes tax-free donations. The company benefits because private insurance pays more than Medicare or Medicaid, with charity-funded insured patients contributing $540 million to the company’s annual profit. The hospitals in Ontario’s largest network are reviewing five million electronic patient records after a patient-reported error leads them to discover a few incorrect records. Ross Martin, MD and his The American College of Medical Informatimusicology debuts his new song “DigituRN” at the Tri-State Health Informatics Summit this week. The term refers to transforming the nursing profession through informatics and digital innovation. Weird News Andy likes that several animation studios worked with the Pediatric Brain Tumor Foundation for free to create short videos explaining procedures and conditions to children, a project they call Imaginary Friend Society. MedData and Experian Health will exhibit at the TAHFA & HFMA South Texas Fall Symposium October 15-17 in San Antonio. Meditech will host the 2017 Physician and CIO Forum October 18-19 in Foxborough, MA. Navicure will exhibit at the Raintree User Conference October 16-18 in San Antonio. Health Catalyst is named as the 17th fastest-growing company in Utah, with sales growing 1,700 percent in five years. National Decision Support Co. and Parallon Technology Solutions will exhibit at the Meditech 2017 Physician and CIO Forum October 18-19 in Foxborough, MA. Netsmart will exhibit at the National Association for Home Care and Hospice Conference October 15 in Long Beach, CA. Clinical Computer Systems, developer of the Obix Perinatal Data System, will exhibit at the Washington State AWHONN Conference October 15-17 in Lake Chelan, WA. Be honest. Insurance is sold across state lines every day in group policies. How would grouping associations be any different. You are not slicing up the risk pool, but making it bigger. “Individual” marketplace it what is slicing up the risk pool because only the needy are getting insurance. Alternatives for the truly sick are being removed by the individual insurance carriers who cannot continue to compete in the ACA marketplace because of the high risk. AND, covering pre-existing conditions is not insurance. Being already sick, and then getting insurance is an oxy-moron. We need high risk pools like we have for auto insurance to be paid with some type of “uninsured sick people” fee to those of us who have the benefit of group insurance or can pay our own individual premiums. The more government gets involved, the worse it gets. You make too much sense. Not shocked how quickly you received a dislike. Yeah, those pesky government-mandated, highly-regulated insurance programs like the Netherlands and Switzerland, which have the best patient outcomes, or government-managed programs like Canada, the UK, Japan, France, Sweden, Germany…. What a terrible idea those all are. RE: the KLAS report on athena health…per the report, more organizations have canceled their contract or delayed implementation (13) than had gone live by Feb. 2017 (8). The report doesn’t include data or color on 5 hospitals who canceled their athena contract in 2016. The claim of 20 still seems possible as only about half of contracted clients were contacted for this report…Applying this rate to all non-live clients would equate to 14 canceled and 12 delayed implementations, or 26 total clients plus the five who canceled in 2016. What department of Cerner/CPSI/eCW do you work in?